ABOVE: From looking at this photo, you might not guess that the Alloggi Marinella is only short distance from airport buses, land taxis, and cruise transportation. INSET BELOW: A guest enjoys the view of a private patio, and the courtyard between the Alloggi's two buildings. Location: On a quiet neighborhood street near the Piazzale Roma. 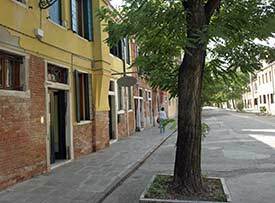 You want to be within a five-minute walk of Venice airport bus, the Treviso airport bus, shuttle buses to the Venice cruise terminals, or the People Mover (which serves the Marittima cruise piers and the Tronchetto parking garage). The Marinella consists of two buildings: the locanda (inn) on the Rio Terà dei Pensieri, a tree-lined street that was a canal in centuries past; and the alloggi (where superior rooms are located), which is just behind the main building across a courtyard. Ground-floor rooms in the alloggi section have private patios next to a canal. For more information about this delightful and affordable 16-room hotel, see our illustrated review. In the first photo, you can see the Piazzale Roma. Airport buses and land taxis arrive in the square, and People Mover trams depart from a station between the garages on the left. The Alloggi Marinella is in the second street to the south of the square (the Rio Terà dei Pensieri). The second image shows the walking route to the Alloggi Marinella. Go up the steps of the bridge at the left of the photo, turn right at the top of the bridge, and continue straight ahead along the canal for one block. Turn right at the Rio Terà dei Pensieri. The hotel is in front of the green courtyard near the top of the frame.